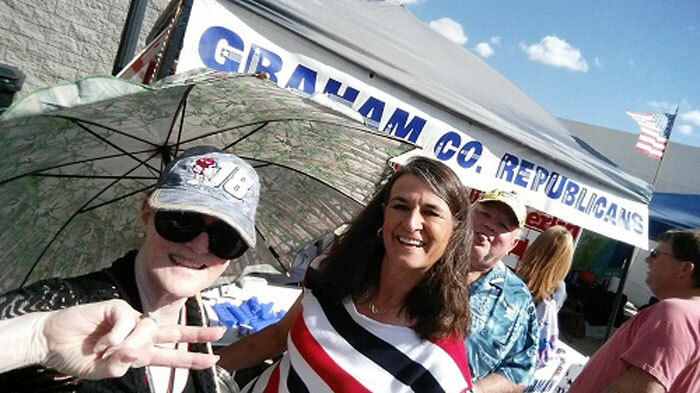 Contributed Photo: Cindy Woodman, shown here with supporters, was elected Graham County Clerk of the Court. SAFFORD – Dental hygienist Cindy Woodman will be the next Graham County Clerk of the Superior Court. In Graham County’s only locally-contested race, Woodman (R) beat Heidi Torrio (D) to succeed current clerk Darlee Maylen. With all 22 precincts reported, Woodman won 55 percent to 45 percent with about 1,000 more votes than her challenger. The Gila Herald called the election for her at about 9 p.m. election night. There were 10,786 total ballots counted, with more than two-thirds of them done by early ballot. Voter turnout for Graham County was just over 60 percent. Jon Johnson File Photo/Gila Herald: Cindy Woodman addresses the attendees of the monthly meeting of the Graham County Republican Party Committee. Woodman wasn’t at any victory party, however, but was out picking up her signs. 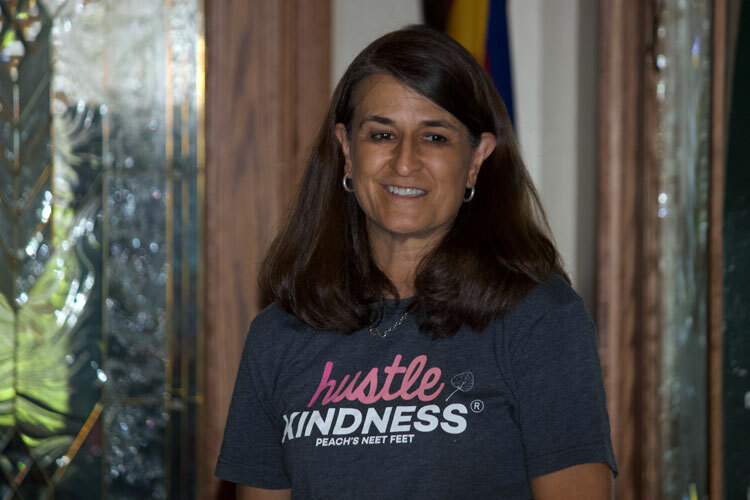 Woodman visited numerous residences door-to-door while running for the office but said that pales in comparison to the work she is prepared to do in her new position. Graham County Republican Party Chairman Duane Rhodes said Graham County stepped up in all races. Jon Johnson File Photo/Gila Herald: Three women running for elected office pose with Graham County Party Chairman Duane Rhodes. 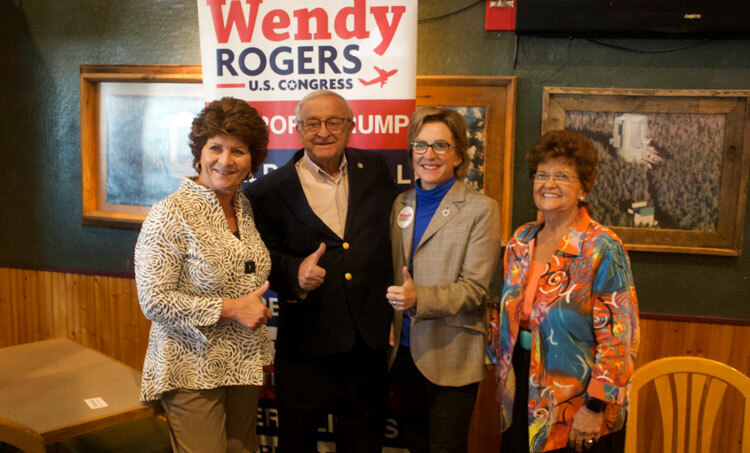 They are, from left, State Rep. Becky Nutt, Rhodes, Wendy Rogers, and State Sen. Gail Griffin. Jeff Larson beat Ralph Orr in District 3, and Richard Mattice beat David Morse in District 5. Incumbent Governor Doug Ducey (R) easily beat challenger David Garcia (D) to win a second term. Kyrsten Sinema (D) and Martha McSally (R) are in a dead heat with McSally nursing a lead of less than 1 percent as of 9 a.m. According to the Arizona Secretary of State’s Office, there are more than 600,000 votes throughout the state to still count, including many in Maricopa and Pima counties, and that a winner may not be known for days. At this point, McSally has roughly 16,000 more votes than Sinema. As of 1:30 a.m., The Gila Herald is projecting incumbent Tom O’Halleran (D) will beat challenger Wendy Rogers (R). Rogers handily won Graham County by a 2-1 margin and was ahead in Greenlee County with 87.5 percent of precincts reported. O’Halleran won Coconino County by a large margin as well as Apache County. David Gowen (R) easily beat Jaime Alvarez (D). Former State Sen. Gail Griffin (R) was elected to the House and incumbent Becky Nutt (R) was re-elected. Proposition 125 permitting the state to adjust benefits in the corrections officers’ and elected officials’ retirement systems is projected to win. Proposition 126 regarding imposing any new taxes failed. Proposition 127 regarding a new renewable energy mandate of 50 percent by 2030 failed. Proposition 305 expanding eligibility for educations empowerment scholarships failed. Proposition 306 prohibiting candidates from transferring campaign funds to a political party or private tax-exempt organization that attempts to influence elections was winning 55.9 percent to 44.1 percent. The Gila Herald will update this article throughout the night.